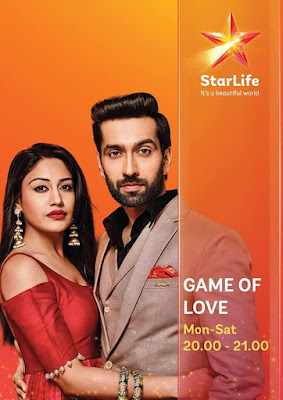 Check out teasers of Game Of Love this November showing on StarLife channel. Anika tells Shivaay that she has given his blood sample to Dr. Chaterjee. Later, Soumya tells Shivaay that he is the father of Tia's unborn baby. Anika confronts Tia and challenges to expose her. The Kapoor sisters, Tia, Svetlana and Romi vow to destroy the Oberois to avenge their father's murder. Meanwhile, Tia insists that Shivaay divorce Anika. Will he? Shivaay asks Anika to sign the divorce papers. Meanwhile, Mrs. Kapoor interrupts Shivaay's nanny when she tries to disclose a secret about his brothers. What is it? Anika decides not to leave the Oberoi House. Meanwhile, Tia tells Svetlana and Romi about her plan against Anika. What is Tia planning? Tia plans to kill Anika. She mixes pills in Anika's tea and locks her in a refrigerator! Is this the end of Anika or will Shivaay come to her rescue? The Oberois are shocked on finding Anika unconscious inside the refrigerator! Tia, Svetlana and Romi vow to destroy the Oberois. Later, Shivaay gets cosy with Anika. Ranveer saves Priyanka from Abhishek and his friends, while Anika learns that Tia is conspiring to kill Shivaay! Ranveer gets injured while rescuing Priyanka. Though Shivaay manages to change Omkara's decision, he fails to stop Tej from leaving Oberoi Mansion. What went wrong? Tia's associate tampers with the brakes of Shivaay's car. Later, Svetlana gets injured when her car collides with Tej's car. Rudra suspects someone else to be behind Ajay's actions. Later, Shivaay has a surprise gift for Anika. Svetlana and Tia plan to kill someone from the Oberoi family, but they are afraid of Anika. Meanwhile, Tej confronts the family for ill-treating Svetlana. Svetlana and Tia plan to kill Anika! On Svetlana's instructions, Tia mixes the chemical in the coffee machine. Will Anika fall prey to their evil plan? Anika suspects Svetlana for trying to kill Shivaay. Later, Svetlana puts up an act to frame Janvi. Omkara allows Svetlana to stay at the Oberoi Mansion when Tej threatens to leave the house with her. Later, Anika and the Oberoi brothers plan to expose Svetlana. Shivaay tells Anika that the private investigator has failed to gather information about Svetlana. Later, he tends to Anika's wounded hand! Shivaay wins the 'Business Man of the Year' award. Later, Omkara is shocked to see Priyanka's obscene MMS. Who wants to defame her? Svetlana tells Tia that Omkara is following her, while Tia decides to avenge Robin's death. Later, Anika apologises to Shivaay. Omkara learns that Svetlana is faking her injury and tries to gather proof against her. Shivaay and Anika lose the way while following Omkara. Later, Anika gets worried as Shivaay's health deteriorates. Rudra suspects Tia and tries various ways to check her phone, while Shivaay saves Anika. Later, Anika is shocked to see Shivaay lying unconscious! Anika confesses her love to an unconscious Shivaay. Later, Shivaay and Anika find Omkara unconscious in his car. Tia tells Romi about her plan to kill Anika. Meanwhile, Sahil asks Anika to confess her love to Shivaay. Will she say the magic words? Anika is worried about her feelings for Shivaay and decides to stay away from him. Meanwhile, Tia tells her mother about her plan against Anika. Shivaay kisses Anika's forehead and assures her about setting things right. Later, Pinki accuses Anika of conspiring against Tia and asks her to leave the house. Shivaay defends Anika when everyone blames her for trying to harm Tia. Later, an injured Svetlana makes a serious allegation. Tej slaps Omkara when Svetlana accuses him of molesting her. Later, Tej breaks his relationship with Janhvi. Anika apologises to Tia on Sahil's behalf when the necklace is found hidden in his crutch. Later, Mrs. Kapoor threatens Shivaay. Why? Mrs. Kapoor plans to kill Anika when Tia tells her that Shivaay will be performing Lohri with Anika. Later, Shivaay and Anika perform the Lohri puja. Shivaay gets shot when he tries to save Anika from a bullet aimed at her. The doctor tells the Oberois about Shivaay's critical condition. Will he survive? Pinki blames Anika for everything that has happened. Meanwhile, Shivaay's condition remains critical. Pinki insists that Anika go away from Shivaay's life. Shivaay gains consciousness and learns that Pinki has sent Anika out. Rudra stealthily brings Anika to Shivaay's ward. Will Pinki get to know about it? Pinki scolds Omkara and Rudra for making Anika meet Shivaay. Meanwhile, Shivaay asks Anika to return. Will she? Pinki is shocked when Shivaay brings Anika home. Later, he defends her too! Svetlana asks Tej to convince Omkara for marriage. Omkara refuses to marry Sonia, while Rudra's decision leaves the Oberois stunned! The Oberois are shocked to know about Rudra and Soumya's marriage. Tej is adamant to conduct Rudra and Sonia's wedding for business purpose but Jahnvi puts her foot down. What will happen at the engagement ceremony? Shivaay supports Anika when Pinki rebukes her. Omkara breaks all ties with Tej after learning about his divorce. Later, another shock awaits the Oberois! Shivaay suspects Tia and Svetlana when he and Anika find a clue. Anika informs Shivaay about what Svetlana and Tej are planning next. The Oberois are stunned when Omkara and Svetlana get engaged. Later, Svetlana demands Rs 100 crore from Omkara. Why? Shivaay pushes Anika when they get into a heated argument and she falls off the stairs. Later, the Oberois are in for a big shock. Anika pours water on Shivaay when he goes near her despite her protest. Later, Anika and Svetlana dance in front of everyone. How will Shivaay react to this? Shivaay gets closer to Anika and tries to remind her about their past. Later, he eavesdrops on Omkara's conversation with Svetlana. Shivaay is shocked to see Svetlana hiding in his wardrobe. Later, Shivaay throws Anika into the swimming pool to make her recall their past. Shivaay's efforts go futile when Anika fails to remember her past. Later, Oberois get worried as Saumya goes missing. But what is disturbing Tia? Anika calls Dushyant. Later, she tells Pinki about her plan to unite Tia and Dushyant! Shivaay kisses Anika's forehead when she feels that she cannot conceive. Later, Svetlana plans to hurt Anika when she sleepwalks! Shivaay tries to make Anika realise her importance in his life, while Mrs Kapoor blackmails him to divorce her. Later, Anika's decision stuns Shivaay! Shivaay decides to marry Tia and tells Anika to make the arrangements. Dadi is shattered! To make Anika recall her past, Shivaay has a plan. Will it work though? Shivaay decides to get Mrs Kapoor's mobile to retrieve Daima's video. Later, Tej confronts Svetlana for deceiving him. A disguised Romi promises to help Shivaay. Meanwhile, Anika is jealous to see Pinki making arrangements for Shivaay and Tia's mehendi ceremony. Shivaay foils Mrs Kapoor's plan as he saves Anika from injuring herself. Meanwhile, he suspects Romi and follows her. Romi vows revenge on Mrs Kapoor, Tia and Svetlana. Later, she demands Oberois' traditional jewellery from Shivaay in return for some information! Shivaay steals Tia's necklace but Anika is accused of stealing it! Will Shivaay come clean?